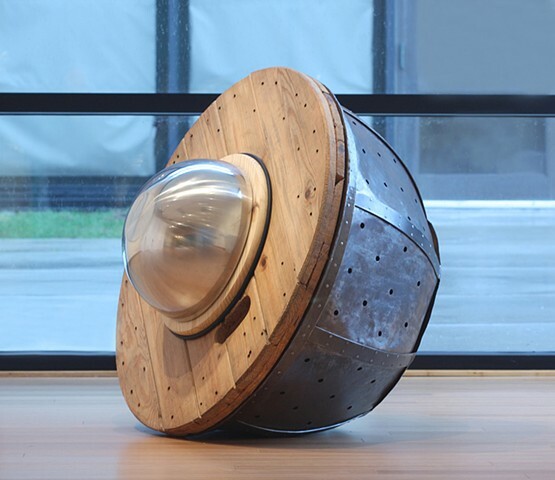 This sculpture is the fifth uniquely made work using the element of this steel bowl form, reusing and repurposing it from a large scale temporary public commission. Originally the bowl was part of, and fabricated for a sculpture, Uproot, commissioned by the Highland Park Conservancy for a special event, Artist Garden Project, in conjunction with the 1996 Lilac Festival in Rochester, NY. It's A Snap won the AXOM Gallery Award for exceptional use of materials/medium, Rochester Contemporary Art Center's 24th Annual Members Exhibition, 2014.